My Wiki Pro is a simple, lightweight and faster WordPress theme for individuals and companies to manage their Knowledge base, Wiki or FAQs. 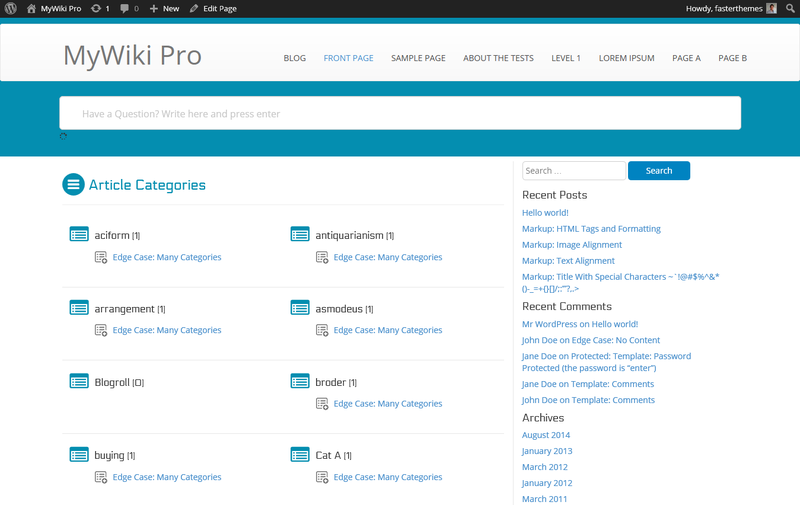 It is a responsive theme based on Twitter bootstrap framework. It is responsive which means that the site will be displayed on every device (pc, laptop, mobile devices, tablets etc) without horizontal scrolling.It is available in six different colors. You can create as many blogs as you want and you can arrange these blogs category wise.This theme also contains search bar so you can easily search blogs on website. You can share your wikis on social media websites like Facebook, Twitter and Pinterest. Users can subscribe for your blogs or wikis from newsletter subscription option. This theme’s layout adjusts to look great on pc, laptops,tablets and mobiles. Speed optimized theme for quick loading. SEO Friendly theme for getting higher ranks in Google/Yahoo/Bing Search engines. Theme has been tested on all the major browers : FireFox, Chrome, Safari etc. 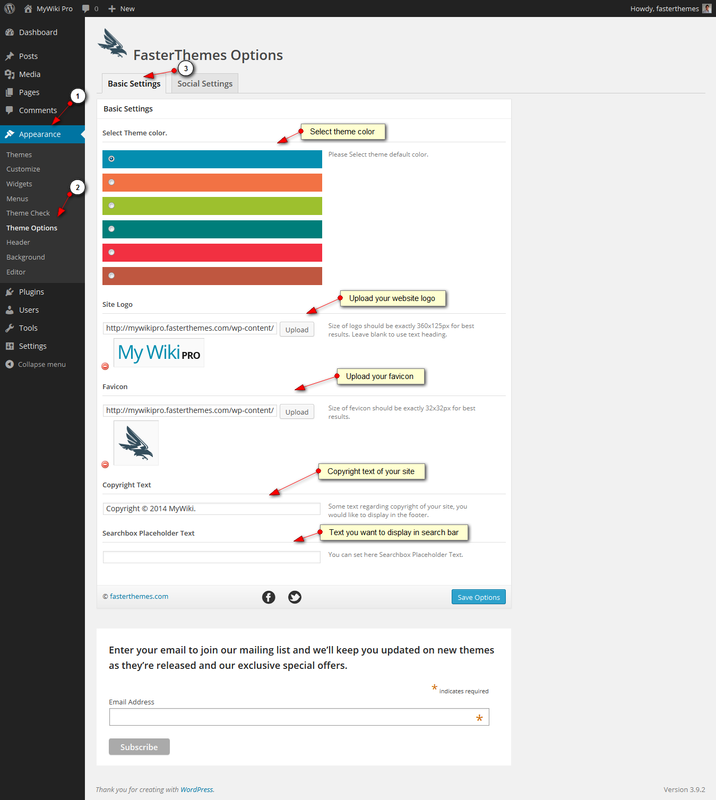 Quickly change aspects of the design with the WordPress customizer. You can link your website with social media platforms Facebook, Twitter, LinkdIn and Google+. You can upload videos in Generator Pro theme. You can see latest posts here. From search bar you can search all your post. Searchbar placeholder text can be set in home page. Post layout can be set.In full width or right slide bar. From here you can make basic changes to the website like selecting theme color, uploading a logo and favicon. You can also add the copyright text. 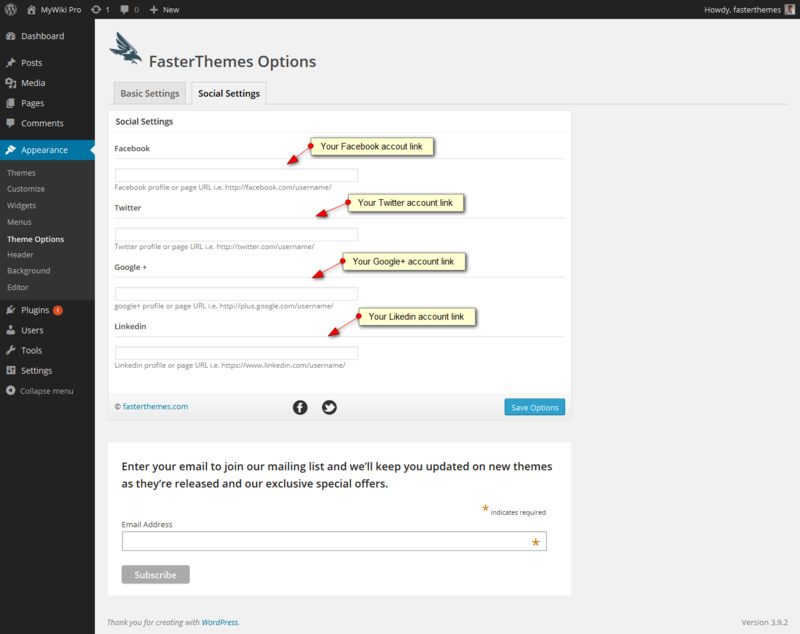 From this option you can set up theme color. My Wiki theme is available in six different colors. Once you set color of your theme you can see that on front end of website. You can see at the moment website in blue color. From logo option you can upload a new logo or can replace the existing logo. Once you click on upload it allows you to choose a logo from your wordpress media library or from your computer. You need to click on select file option then it will upload image from your computer to wordpress image library and you can set up your logo. You can see logo left side in top header. From favicon option you can set a favicon for the website. You can upload .ico file to set favicon. This option allows you to change the copyright text which appears in footer. You can see copyright details in bottom of website. From below option you can select search box placeholder text. Your website users can see that placeholder text in frontend. In this part you can add links of your social media profiles like Facebook, Twitter, LinkdIn and Google+. Users can check your social media profiles by clicking on these icons. After entering your social media links you see that in bottom of front page. For setting up home page of My Wiki Pro theme you need to go to back end of your WordPress installation. After choosing your template you need to click on create home page button. You can put whatever content you want to put in there. 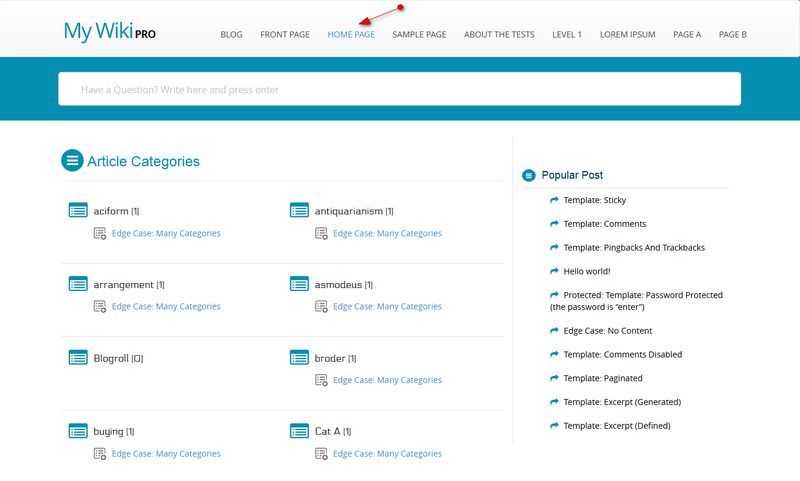 After that you need to choose My Wiki template from template option which appears in right side side. You can look at example below. Once you click on publish you can look home page in front end of your website. When you are creating any post you can select either you want to display that post in right slider bar or in a full width. Here we have set post in full width so when we click on post we can see it in full width.